Site-specific ideas for the future of opera. Grand opera costs millions of dollars. We are working on operas for your coffee table, the Parlor Opera. Our next portable opera will be distributed to the world's living rooms through the design of tunnel books. A new project for the 2016-17 seasons, the library opera is designed for touring presentation in the great library spaces around the world, using video projection mapping and live singers with electronics. The first Library Opera will have a libretto by the bibliophile Alberto Manguel. 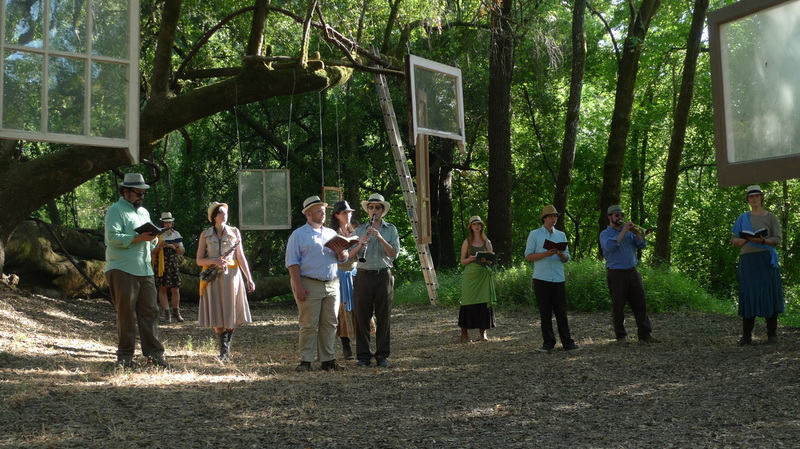 An opera to be experienced outdoors, within earshot of a river. Our first, Stages of the Russian River, was produced in 2014 at the historic Warnecke Ranch & Vineyards in Healdsburg, California. In design and planning stages for presentation in New York in Spring 2017, the Panorama Opera explores the possibilities of opera without stage set, singers, costumes, lighting or choruses. There is one existing element: an architectural space with a huge painted canvas on the walls, the opera's backdrop and narrative imperative. The goal is to create a complete artwork that complements this existing historical panorama, using only immersive sound. The Forest Opera is conceived for a private client whose home overlooks beautiful forestland, on a steep hillside, with mostly old-growth redwood and Douglas fir. The intention is to animate the forest, using lighting in the trees synchronized with an operatic experience broadcast from loudspeakers placed in concentric rings, deeper and deeper in to the forest. This design adds depth to the perception of the space, since in most points of view the forest presents only a monolithic front. The sound and lighting experience restore the possibility of perceiving foreground and background which are hallmarks of a typical landscape vista. Hugh Livingston's first opera, The Underground Gardens of Baldessare Forestiere, depicted the life of a Sicilian immigr﻿ant ﻿who dug himself an underground residence in Fresno, Calif., totaling more than 100 underground rooms on 16 acres.